Twenty years ago, the premier advice, from givers-of-advice on job searches, was how to prepare for the question, “What do you see yourself doing in five years?” Sometimes the time frame in a very aggressive job search put the number at ten. I had no idea. Usually I could figure out today and even a week in advance, but five years? What would I be doing in five years? Even pondering the question made me laugh out loud. Not to a recruiter’s face, mind you, but otherwise, yes. Laugh out loud. I was asked to ponder the question in high school. And after I began college. Again, I had no idea so I took the basics and let it go at that. Even twenty years ago, living a professional life in Washington D.C., I had no idea. I’d already had several careers. Perhaps I should say “faux-professional.” As a contractor for the Office of Personnel Management, I was, essentially, a part-time teacher. Oddly enough, my future really was in my past. As a kid, I wrote all the time. A diary, mostly, that I hid under my pillow and was always surprised when my mom found it. And outraged, I might add. But I never expected to be a writer. That simply wasn’t on my horizon even though my mother wrote a column for the local paper and my grandmother was a poet. But my grandmother was dead and my mother annoying. Why would I be a writer? But I am. What I really and truly dreamed about was a home, a husband, kids, and a picket fence around it all. Truly. So in high school, I got tired of the question and left school to marry a soldier. We moved all over the place but no picket fence. No marriage after a while either. But I did have kids. I was part of the way there. In 2003, Cliff and I bought this 1924 two-story stucco and brick house with a privacy fence around the back yard. Taller than a picket fence, but nonetheless, a fence. In 2004 we married. In 2005 we got a kid. True, oldest kid who came to live with us and go to college, nonetheless, a kid. And that’s how we’ve lived ever since, home, fence, kid. Categories Morning Musings, Uncategorized•Tags Daily Post, family history, Kansas, making choices, marshall county, military wife, picket fence, self-reflection, what do you want to be? 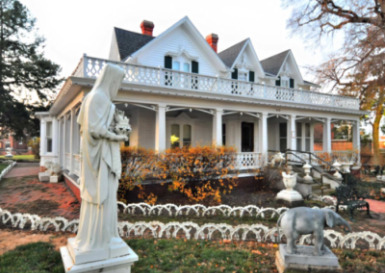 As a child, when I passed the Koester House, either walking or riding in the car, I’d long to enter the grounds and the house and see what was there, to feel like a lady in a white Victorian mansion. But I didn’t. The house had a Never Land quality to it, a magical place with flowers and trees and small statues of animals scattered across the lawn. A three-foot tall brick and cement wall circled the property with a cement sty, steps leading up to a white gate and over into the magical land. I never went through that gate. I only looked at the house and dreamed. Ah, the dreams with which we build our lives. I lived seventeen miles outside of town in a farmhouse built by Grandpa Albert’s father sometime in the late 1800s, about the same time as the Koester House was built in town. Our front porch we called the East Porch to differentiate it from the South Porch. The East Porch held crates of fresh eggs and the milk separator and muddy boots while the South Porch held an extra bed, the large chest freezer, and stuff there was no room for in the house. Not exactly wrap around elegant porches with carved grills. The outside of our farm house had tar paper shingles as many old farm houses did in those days. I suppose we were poor, but then no farm family with six kids was exactly rich. We had what counted: food, clothing, shoes, school supplies, the books we wanted, and my favorite, a full set of The Child’s Book of Knowledge. But no elephant statues in the yard. No magic lands, except in our imaginations, and places in the timber that held swings made of vines and a huge fallen tree we called our elephant as we clambered up the side to straddled it and ride into far-away lands. Last Thursday evening, I gave a reading at the Koester House and for one evening the house was mine. It was odd, stepping up those steps of the sty and over into the yard. Almost like a rite of passage into a new and different world. Last week, the lawn was filled with snow, but the fountain in front and the little, white-painted animals were still there, and the antler-shaped edging along the paths, while capped with snow, lined my journey to the front door. For that brief journey from outer sidewalk to the front door, I felt like a child. So many things change in sixty years. Our farmhouse is gone although the farm remains. Marysville has grown into a prosperous town. I’m certainly older. But the little girl inside the lady smiled as she opened the front door. The days leading up to New Year’s Day are usually filled with reflection: newspaper stories run the top stories of the year; web sites run the top photos of the year; most of us in one way or another reflect on the year past. When we make our resolutions for the coming year, it’s usually about giving something up, forcing ourselves to change things that seem harmful. For most of us, the year has been a mixed bag: grief and joy, failures and celebrations, deaths and births, fierce storms and delicate sunrises. We have prayed for peace and hoped for an uplifting of consciousness in a seemingly futile gesture. What if nothing needs to be forced to change? Forcing ourselves to change is the very thing that gets in the way. What if changing only means practice? For example, to learn how to type on a keyboard, you have to practice. Perhaps the best thing any of us could do for the collective lifting of consciousness is to change our focus from the “collective” to self. What if, instead of hoping the world will change, we change ourselves and the way we communicate to the world through others? What if we were to practice bringing awareness into our communication? Anytime we use language, we have the chance to practice a different way of using it. Self-observation helps us discover what needs to change and how to go about practicing that change. What if we were to add something to each and every communication pattern? For example, adding the practice of a quick pause before saying something. What if, in that pause, we’d practice taking a breath to give ourselves time to respond instead of immediately reacting? If we were to practice saying, “Help me understand what you mean when you say…(fill in the blank)…” instead of assuming we know what the other person means because of our own experience, might we avoid so much of the discord in our families, loves, lives, work relationships? By acting (speaking) and therefore, being, different, can we change the world’s consciousness? What if being was about being eternally present? Some call this “present” witnessing consciousness; others say centering prayer. The words for it aren’t important—the practice is. Daily life with all its changes spins around like a storm circling. But we can stand in the calm center. We might not be able to avoid all the debris falling around, but we can, with practice, constantly return ourselves to a calm center, constantly lifting consciousness, one person at a time. Another lesson in forgiveness. Okay. I can imagine Peter wanting a simple answer. But Jesus replies, no, not seven times, rather seventy times seven. Now while my math isn’t all that great, that adds up to almost five hundred. Four hundred and ninety, to be precise: 490! If the numbers are taken symbolically, 4+9+0 adds up to 13. Thirteen is the number of death and rebirth. And adding 1+3 equals 4, the number of power. So you could say that if one were to forgive anyone seventy times seven, the repeated act of forgiveness would lead to a transformative and powerful experience. Forgiveness equals power – not power over, but the power to forgive ourselves. The first time I was told that forgiving myself could lead to forgiving others for hurts I had experienced, it felt as if I’d been flung against a wall of impossibility. Forgive myself? Myself? I hadn’t caused the hurt to me! Others had! And yet, when I could finally forgive myself for carrying anger and blame towards others, I was able to put it down. I didn’t have to carry it any longer. Like seventy times seven, forgiveness is a continuing practice. Almost every day, we can see some affront that could rile us up. What could our world be like if we were to practice taking responsibility for the hurts we do to ourselves by our frustrations and our angers? What would our personal world be like if we were to practice forgiving ourselves and, in that process, forgiving others?